Hotspot is a place in the Upper mantle of the Earth at which hot magma from the Lower mantle upwells to melt through the crust usually in the interior of a tectonic plate to form a volcanic feature. Region of the Earth’s upper mantle that upwells to melt through the crust to form a volcanic feature. Most volcanoes that cannot be ascribed either to a subduction zone or to seafloor spreading at midocean ridges are attributed to hot spots. The 5% of known world volcanoes not closely related to such plate margins (see plate tectonics) are regarded as hot-spot volcanoes. Hawaiian volcanoes are the best examples of this type, occurring near the centre of the northern portion of the Pacific Plate. 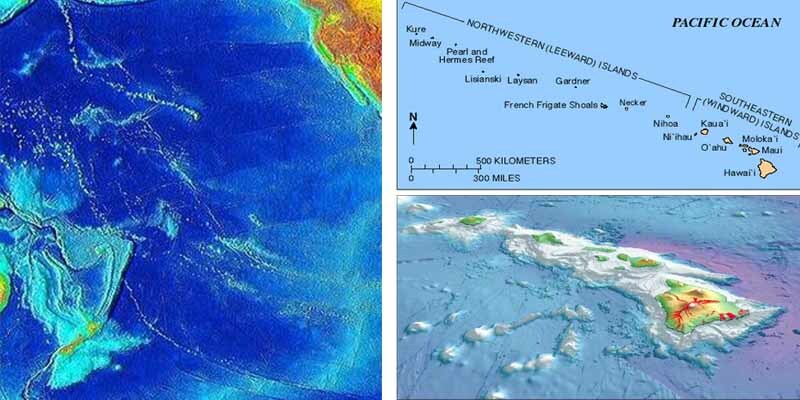 A chain of extinct volcanoes or volcanic islands (and seamounts), such as the Hawaiian chain, can form over millions of years where a lithospheric plate moves over a hot spot. The active volcanoes all lie at one end of the chain or ridge, and the ages of the islands or the ridge increase with their distance from those sites of volcanic activity. The surface manifestations of plumes, that is, columns of hot material, that rise from deep in the Earth’s mantle. Hot spots are widely distributed around the Earth. One of their characteristics is an abundance of volcanic activity which persists for long time periods (greater than 1 million years). When the lithosphere (the rigid outer layer of the Earth) moves over a plume, a chain of volcanoes is left behind that progressively increases in age along its length. Hot spots are believed to be fixed with respect to each other and the deep mantle so that the age and orientation of these chains provide information on the absolute motions of the tectonic plates. Posted on January 25, 2015 December 23, 2015 Categories Earth Hotspots, Hotspot VideosTags Hotspot5 Comments on Earth’s Hot Spots.